After all that heavy but oh-so-delicious food last week, I definitely needed to get back on track with something on the lighter side. This recipe is inspired by the one and only Ina Garten, who so famously says, "How easy is that?" There are a lot of chefs that say "easy" but have clearly never looked up the meaning of the word. Ina or more commonly referred to as the Barefoot Contessa, is quite honestly the only chef whose recipes claim to be easy and actually area. She lets simple flavors shine and I really like that approach in cooking. I love easy and I love to eat healthy, but I mostly love when easy and healthy tastes good. This tastes good! The fennel has a sweetness that packs a lot of punch but blends well the other vegetables. I am a BIG fan of brussel sprouts but if you are not, these could easily be taken out. Anything you want to add and/or delete isn't an issue for this dish as it's just vegetables...roasted together. The only thing I would suggest is to be careful of the amount of time you roast each veggie. Depending on the size and/or depth of the vegetable, each one may require a little less or a little more roasting time. In addition, keep a close eye on them as you don't want to burn them. If you do those two things alone you cannot mess this up! Microwave the full sweet potato for 2 minutes. This helps soften the potato for cutting and speeds up the roasting process. Peel and cube potato and place on sheet pan. Next, cut the fennel bulbs into 6 wedges each, cutting through the core to keep the wedges intact. Drizzle the olive oil on the potato and fennel, then sprinkle with 2 teaspoons salt and 1 teaspoon pepper. Toss with your hands. Roast the vegetables for 15 minutes, until the potatoes are tender, tossing once while cooking. 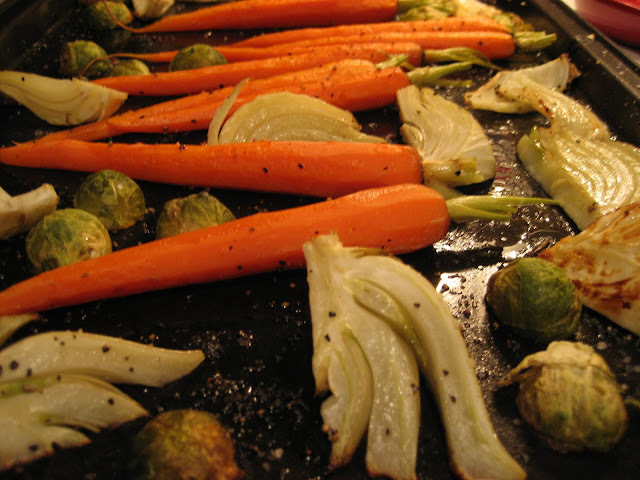 Toss the brussel sprouts and carrots in and roast for another 15 to 20 minutes or until all the vegetables are tender. Sprinkle with a pinch more salt and pepper and serve hot.